This post was written by Mary's uncle, Chuck Hutson of Vandalia, on Thanksgiving. We were both really touched by his words, and wanted to share it in our blog. We hope each of you reading had a wonderful Thanskgiving and remembers to count each of your blessings on Thanksgiving and every day. I have long been thankful for my many blessings, and even for some things that I have felt and learned that did not seem like blessings at the time. Its easy to be thankful for our blessings once we get past the arrogance of youth when we think we know it all. When we move past the stage of "Why did you let this happen to me lord?" to the stage "Why me lord? What have i ever done to deserve even one of the pleasures I've known?" When we get past thinking that its all about us, and realize that there are others who share this life with us. Its easy to be thankful when you take a look around and see and feel all the wonders of life. I've long believed that life is heaven enough...and hell enough...that I don't need the promise of heaven, or the threat of hell to think about how I live my life. A little hundred year old lady named Grace passed away at my nursing home recently. Most of the 15 years she was there, I spoke with her almost daily. She was a simple woman and often pointed out a simple lesson she had learned...that there are always around us, people who are less fortunate than us. And she was thankful for her blessings. Obviously that also meant that there are always people around who are more fortunate than us as well. She never dwelt on that. The bright morning sun was shining in on me through the window of the living room where I sat writing. I love the sunshine...but I understand the need for the rain. To enumerate all my blessings seems such a matter of fact thing...but I feel them swirling around in my brain and my heart. The old song "Count Your Blessings" seems another good lesson...but I can't seem to count that fast, or that far, or that long...but i feel them every day. I wear a purple rubber wrist band each day...and I touch it often during the days. Sometimes unconsciously, and other times very thoughtfully. I've never liked wearing any kind of jewelry, or even any of these kinds of bands. Always hated when I tried to wear a watch or bracelet. It always got in my way or caught on things or otherwise was an irritation. But not this purple wristband. It makes me think. 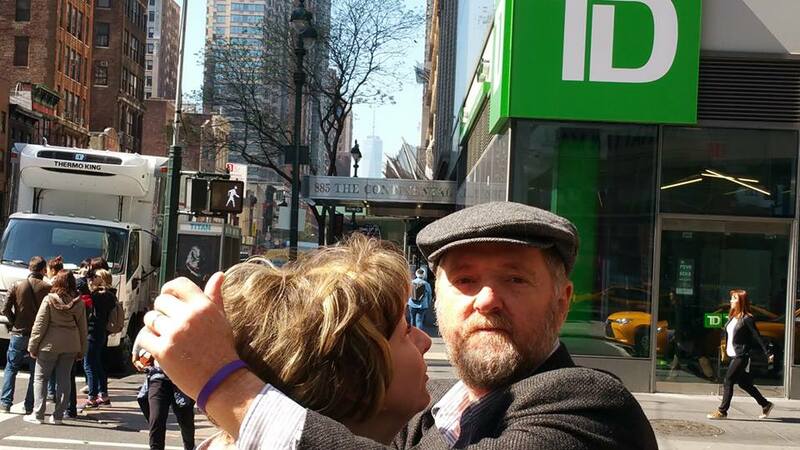 My Uncle Chuck and Aunt Jodi wearing his Gracelet in New York City. Think of all the blessings in my life...in all our lives...but mostly it makes me think of the little angel I wear it for...whose name also happens to be Grace. If I hadn't believed in angels before (I've pretty much always believed in them), I certainly would now. I can't believe that this little girl sent into all our lives is anything but an angel. All you need to do is see her smile to understand that. The thing I don't understand...is why? Why? One day, much too soon, God will call our little angel home. She's not like other children you see. She has a rare terminal disease that will send her back to God before we are ready for her to go. I think...that no one would consciously ask to have a little angel visit us for years...to bring such joy into our lives...and then to be slowly taken away... But while we can't understand the Why of it...we truly CAN learn the lessons that this little angel has come to share with us. I spin the purple band on my wrist. I twist it. I snap it...and I pinch it together. It has stretched and worn since I began wearing it...like our lives and our hearts. Give thanks...for all your blessings...not just on Thanksgiving Day...but every day of your lives. And think especially, of this little angel...and of the other little angels our there who visit us...and the lessons they come to share with us. And if you would...say a little prayer of strength for the parents and family of this little angel who wrist band I wear.